Guess what? It’s Giveaway Time on Spilling Ink! This event celebrates a few things—finishing earlier in the month Draft Three of my latest manuscript and the subsequent, preliminary nibbles of interest from some significant publishing professionals. While we’re at it, let’s celebrate Spilling Ink’s new header image too! What do you think? In my Shakespeare’s birthday giveaway, a fun prize pack of a book and Shakespearean Insult Bandages was up for grabs. 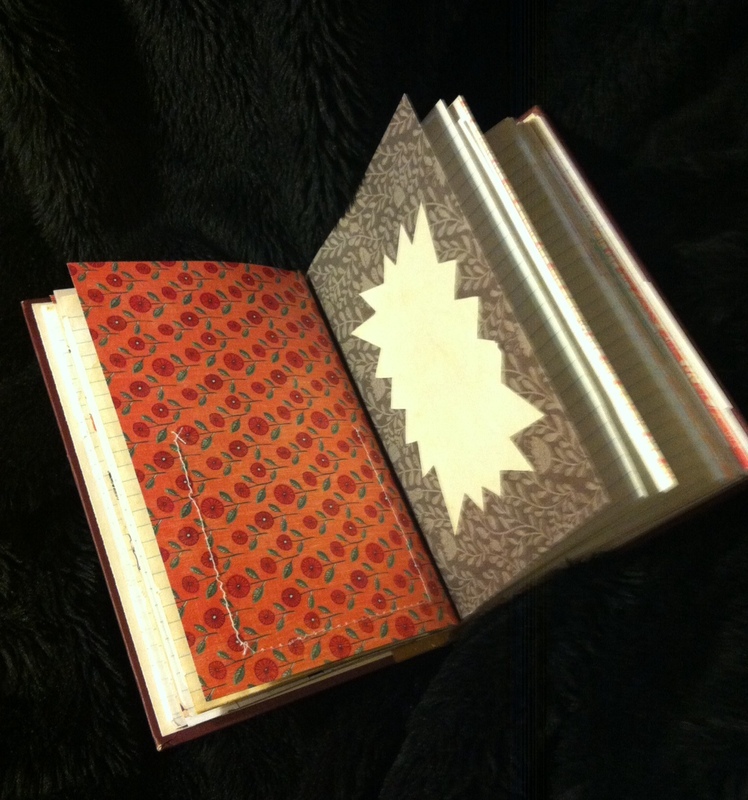 This time, I’m giving away a gorgeous handmade journal, similar to the one my friend made for me. The journal is the creation of my artsy friend Kerry. She’s done the recycled cover in heritage mahogany and mustard, colours which are repeated throughout the hand-sewn pages. You’ll find pretty prints and quirky snippets from pattern books, vintage children’s stories, and pages from old record books. Comment below or on my Facebook page. In the comment, tell me how you’d use your smash book. I’ll randomly draw one winner on Monday, 11 August, 2014. In the meantime, if you’re interested in purchasing one of Kerry’s lovely designs, email me on alison underscore stegert at hotmail dot com and I’ll send you put you in touch. Posted in Spilling Ink Special!Tagged crafty things to make for writers, Giveaway, handmade journal, smash book, win a prize! Hi Ali, Congrats on early finish to draft 3 and publishing nibbles – that’s exciting. Hi Jenny–the journal would be a perfect space for your poetry. I think you’d need a whole collection of them, since you’re so prolific! Hey there! I can’t actually re-post this on any media site – I’m not a part of any and I don’t trust them…so, sorry, I can’t do step one…. HP-Fanatic, your songs would look awesome in one of these! P.S. Pinch and a Punch! Also, it’s the horses’ birthday today! Yay!! Hi Ali, congratulations on all your successes in your writing life. It’s wonderful to hear about your journey and read your updates. I love your friend’s book. She is very talented. If I owned a book like that I’m sure we would become best friends, like my other journals have all become and live beside my bedside table ready for me to jot down any new ideas that happen to pop into my mind during sleep and I would certainly show it the world in which I travel, where it would ride around in my backpack, again at the ready, for me to note down the things I see. We truly would be inseparable and I know I would grow quite dependent upon my little note buddy. However, if I was to win this gorgeous note journal, I think I would pay it forward to one of the young gifted students I teach creative writing to, in the hope it might inspire them to jot down their wonderful ideas and learn to be disciplined in capturing their inner thoughts. Maybe a journal like this would encourage a young writer to fill it with their experiences in the hope to enrich their writing and make the writing world a better place for it. I love these ideas, Deb! A repository for the wee-hour inspiration or a gift to student–both are great ways to use a smashbook. Thanks for visiting, and good luck in the draw! Oh wow, I loved your previous post on those lovely journals and now you give us the chance to win one! 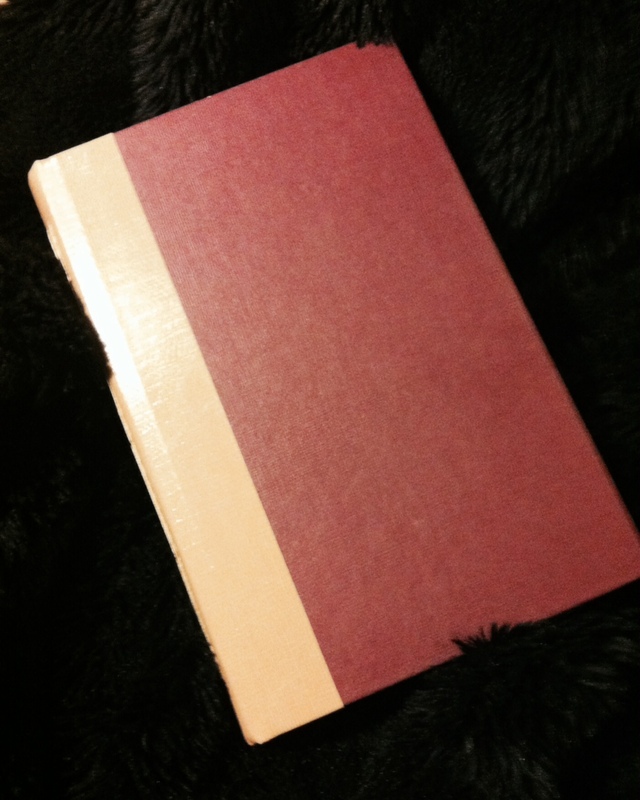 As I said before, it is really hard to use such a precious journal for fear of not doing it justice. However I am doing a lyrical language course in September and it would just be the right place to document some lyrical thoughts and poems. One of these journals seems like the perfect place for lyrical writing. I second HPFanatic’s question about your course. It sounds fascinating! I’m guessing it’s poetry? Can you tell us more?